Major Stefanie Campbell joined the sheriff’s office in 1986 and serves as Commander for the Support Services Bureau. The Support Services Bureau is comprised of nine divisions: Communications, Training, Records, Fleet Operations, Forensic Science, Forensics Accreditation Division, Property and Evidence, AFIS, and Purchasing & Materials. The bureau has a total staff of 233 sworn and non-sworn members. One of the larger divisions she oversees is the Training Division and includes both a detention and law enforcement contingent of trainers. Major Campbell is also responsible for coordinating all of the leadership programs within the agency. Her most recent undertaking was to develop and complete training for the school guardians prior to the start of this school year. 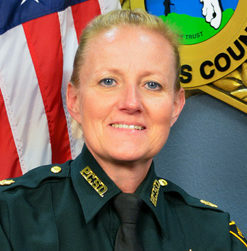 During her tenure with the sheriff’s office, Major Campbell has served in the Patrol Operations Bureau, Crimes Against Children Unit, Crimes Against Persons Unit, Court Security Division, Property and Evidence Division, Training Division, and as Captain of the Support Services Bureau. In 2015, Major Campbell became the first law enforcement certified female to be promoted to a major. Major Campbell earned her Master’s in Public Administration degree from Troy State University.